Do you go running on holiday? I guess the answer depends on whether you are a runner or not and secondly, if the answer to the first question is “yes”, what kind of runner. Maybe I am some kind of head-case but wherever I go, be it on business or for pleasure, I find myself sizing up the local neighbourhood for runing routes and when packing, I always include a set of running gear. Do you think I am mad? Maybe so, but maybe you also have that runners blood flowing through your veins. This year for our holiday we returned to the same place for the third time (unheard of for us before now) and certainly packed our running gear. On arrival in Crete our holiday company representative gave us the mandatory talk including dire warnings for people not used to the warmer climate. The advice is to drink plenty of water (and then some more) and use industrial quantities of sun lotion and insect repellant. When we told her we were going to get up at 6 AM to go for a run along the coast, we were expecting her to think we were stark raving mad so we were taken aback when she said it was a brilliant plan and we then had one of those runner to runner conversations that are probably completely unintelligible to the rest of the population. In England we think that any temperature above around 20 degrees celcius is a warm day. Anything above that is cause for complaint and the whole national infrastructure shuts down in the same way it does if there is an inch of snow. This time last year we spent a week in the Slovenian Alps where the temperature reached the dizzy heights of 27 degrees and yet we managed the epic run up the Vršič Pass (see Passing Out). Here in Agios Nikolaos in Crete, a thermometer on a bus I was in yesterday claimed it was 37 degrees and I could beleive it, so here we have quite a different climate. The town of Agios Nikolaos is spread along three bays. One has the marina (and a beach), the second is another beach and the third is the harbour area that sometimes docs some serious cruise ships. It also has an inlet to a little fresh water lake which is famed to be bottomless! 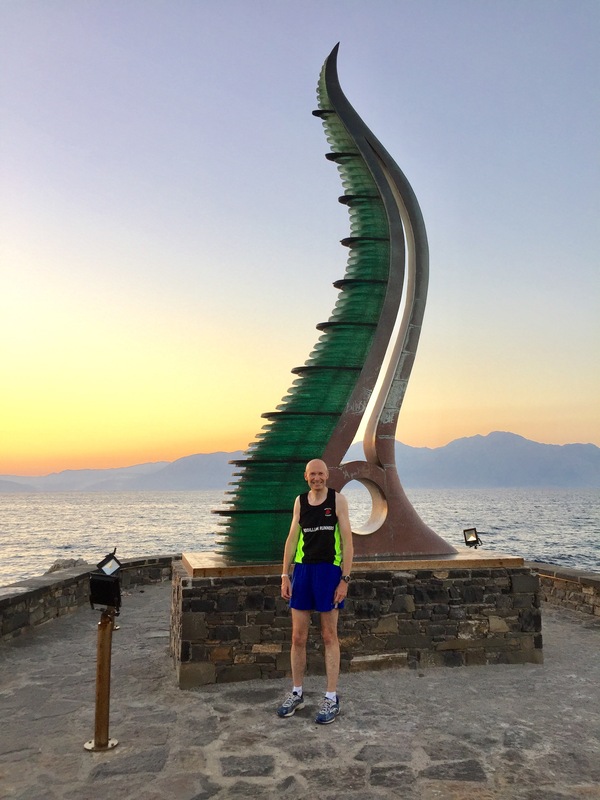 If you run from our hotel (the Miramare Resort and Spa) along the coast to the main harbour, it is around 1.5 miles so is a great route for a 3 mile out and back. At 6 AM, just before dawn it is about 24 degrees and so still quite a warm run but you had better not leave it any later because when the sun comes up (and it comes up really fast), it’s hot. We are not the only ones because we saw two other runners out this morning and another out in the midday sun and that is madness. Previous Previous post: You cannot be serious!